Go to Appearance >> About Super Construction. Click on Recommended Actions tab, Install One Click Demo Import plugin and Activate it. Go to Appearance >> Import Demo Data and click button. How to change Favicon, Logo, Site Title & Tagline? 3 different options to display Logo, Site Title and Tagline are available on this theme. – Site Title is the main title of website. – Tagline is the description of website which is visible just below the site title. – Site Icon is the option to add favicon of website. It is recommended to use the square image for favicon. How to setup Home page? Go to pages and click add new page to create new page. Assign template Home and publish it. Assign newly created Home page and save the changes. How to add widgets (sections) on Home page? You can drag and drop widgets to Home Page Widget Area. How to add Main Menu? Go to Appearance >> Menus. Click on create a new menu, name it Main Menu and assign it to Primary Header. Add page, post, category or other available options to it and click on Save Menu. How to add Social Menu/Links? 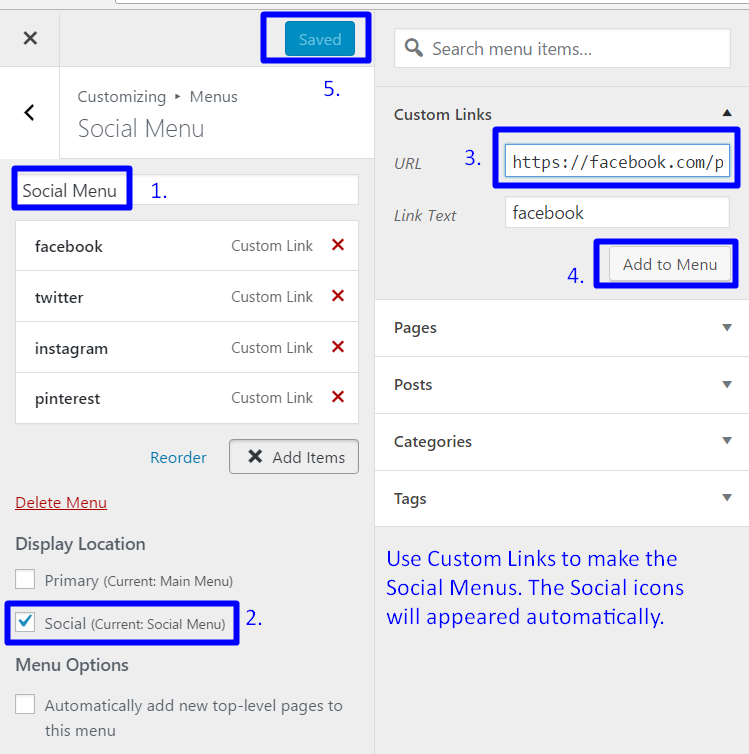 Click on create a new menu, name it Social Menu and assign it to Social Links. Add full url of social networking sites like facebook, twitter, instagram, etc to it and click on Save Menu. Go to Appearance >> Customize >> Featured Slider Options. Select pages for slider and use other options for setting. Click on Save and Publish to save the changes. CSS added here will override the CSS of theme. You can use this option to customize any style of the theme. Add your custom CSS there. Hope, this will help to make your site as demo of the theme.